What are the challenges for developed industrialized nations? As part of the economic development process, service sectors in industrialized nations such as Germany have long since established themselves as the most important economic sectors. However, productivity increases in the service sector have been weaker than those in the manufacturing sector. This raises income inequality. Increasing international trade in services could serve to intensify this trend further. In this blog post, economic structural change is described using the German economy as an example. The trends presented below pertain to the Federal Republic of Germany (between 1970 and 1991) and reunified Germany (between 1991 and 2016). This analysis focuses on the manufacturing and service sectors. To begin with, the trend towards a service economy is indicated by changes in employment figures. 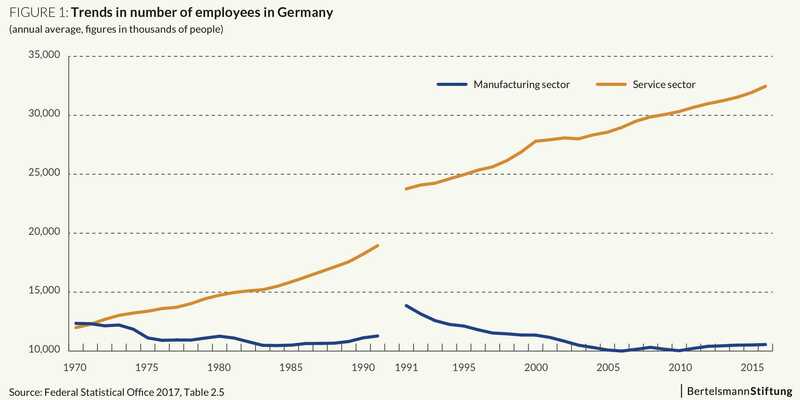 At the beginning of the 1970s in Germany, both of the aforementioned sectors employed a similar number of people (approximately 12 million each). In 2016, the number of employees working in the entire service sector amounted to over 32 million – around three times higher than the figure for the manufacturing sector. 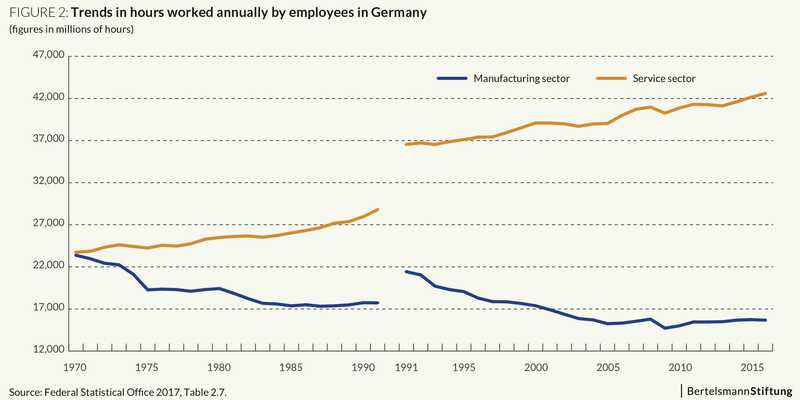 Despite the German population increasing due to reunification, the number of manufacturing sector employees in 2016 (around 10.5 million) was lower than the 1970 figure (see Fig. 1). Analysis of the annual hours worked confirms this trend. Between 1970 and 2016, the number of working hours performed annually by employees in the manufacturing sector decreased from 23.4 billion to 15.7 billion – a drop of around one third. In the service sector, the volume of work performed annually rose by approximately 80 percent (from 23.7 billion hours to 42.6 billion, see Fig. 2). Although the number of hours worked in the manufacturing sector sank between 1970 and 2016, gross value added measured in current prices increased five-and-a-half fold from EUR 157 billion to more than EUR 860 billion. Value added rose in the service sector as well, from EUR 157 billion to EUR 1,950 billion (a twelve-and-a-half-fold increase, see Fig. 3). If the gross value added per hour worked is taken as an indicator of productivity, then the following trend can be observed. 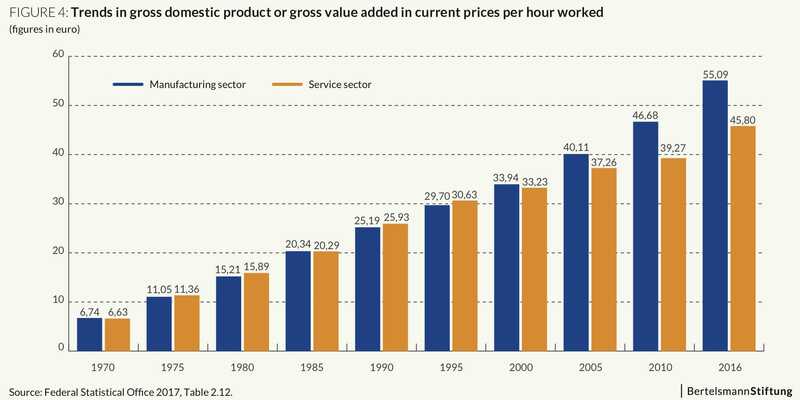 Up until the beginning of the 2000s, gross value added per hour worked in the two sectors under review here was more or less at the same level. Since then, however, productivity in the manufacturing sector has grown more strongly than in the service sector. The result: in 2016, average productivity measured in this way was around EUR 10 higher in the manufacturing trade (EUR 55) than the corresponding figure for the service sector (see Fig. 4). Value added is a crucial criterion in determining the amount of wages that a company pays its employees. Therefore, the fact that the two economic sectors under review here are drifting apart in terms of productivity will result in a growing difference in wages. In 1970, employees in both the manufacturing sector and service sector received an average gross annual income of approximately EUR 8,300. In 2016, the average annual income in the service sector stood at approximately EUR 37,200. 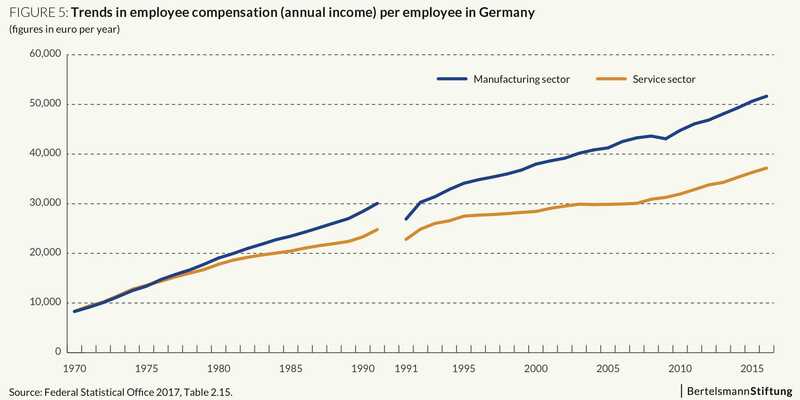 Meanwhile, in the manufacturing sector, the average annual income was almost EUR 14,500 higher (see Fig. 5). An important reason for these wage differences is the fact that capital and technology are used differently in both sectors. In the manufacturing sector, employees can make their products using machines. Use of machines enables high productivity – and therefore high wages. In the service sector, there is significantly less use of machines. This results in lower productivity and lower productivity increases as well. This, in turn, leads to lower wages and lower wage increases. These different opportunities for the use of capital in production are causing the income gap between the two sectors to increase further. However, it should be pointed out that digital technologies can be deployed in the service sector as well. 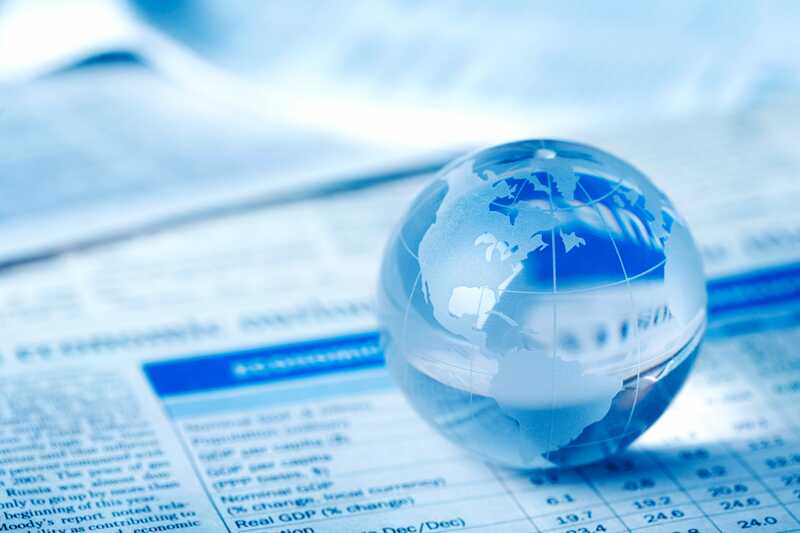 Examples include online trade, translation programs and many more. This increases productivity and therefore wages. As can be seen in Fig. 4, gross value added per working hour increased at more or less the same rate across the two sectors between 1970 and the beginning of the 21st century – and this despite the fact machines and technology were used differently in that period as well. I believe this development can be attributed to foreign trade, among other factors. The relatively strong productivity increase in the manufacturing sector leads to corresponding wage increases in that sector. This wage trend has an effect on the service sector, where it also results in corresponding proportional wage increases. Associated higher production costs lead to a price increase and thus to an increase in the value added. 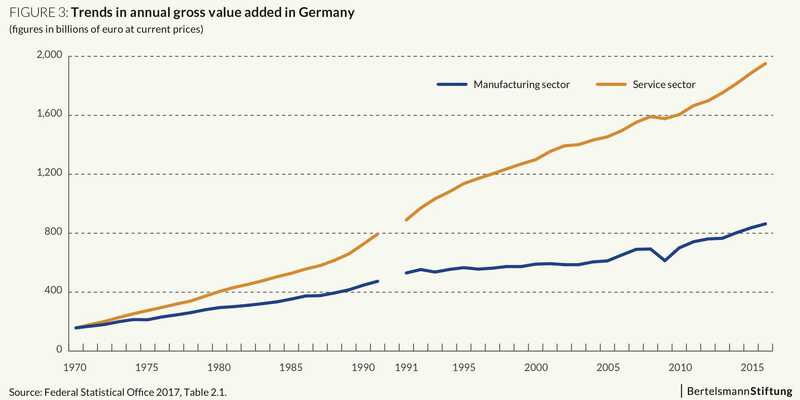 Although services flow into the production of material goods and the resulting higher wages in the service sector have a negative impact on international competitiveness, German companies were able to withstand these price increases up until the beginning of the 21st century. The reason behind this was the fact that German companies found themselves competing predominantly with companies from other industrialized countries, which were facing the same challenge. Since the beginning of the 21st century, the structure of international trade has changed. The accession of China to the World Trade Organization in 2001 and the EU’s eastern expansion incorporated low-wage countries into global trade to a greater extent. This has caused cost pressure on companies in industrialized countries to increase. Due to this competition with low-wage countries, only highly-productive companies are still competitive in industrialized countries. They can afford correspondingly high wages. This competition has another consequence. In developed industrialized countries, wage increases in the service sector that are higher than the quantitative productivity increases now play a role. As a result, wages in the service sector now develop in line with quantitative productivity trends. Wage increases for employees in the service sector are therefore lower than in the manufacturing sector. In the future, pressure on wages in the service sector could become even more intense if services are traded to a greater extent internationally. The above explanation of the significance of foreign trade for trends in service sector wages in developed economies such as Germany is only one conceivable explanation. There is undoubtedly need for further research in this area. However, if this approach proves correct, this would have far-reaching consequences for trends in income in developed economies. It can be assumed the competition with low-wage countries will not slow down for the time being. So cost pressure will not lessen. As a result, wages in the two sectors under review here will continue to drift apart and therefore there will be growing market income inequality across the entire economy. This could result in increasing social tension which would then have a negative impact on both political and economic stability. However, another possibility is that wages in the service sector will have to increase more strongly than productivity increases, as otherwise companies will not be able to recruit the employees they need to sustain production. This would have a negative impact on international competitiveness. It could lead to a rise in unemployment, which would also serve to generate social tension. Either way, differences between the manufacturing sector and the service sector in terms of productivity trends may result in significant challenges – for which socio-political solutions would need to be found – in developed economies. Statistisches Bundesamt (2017): Volkswirtschaftliche Gesamtrechnungen – Inlandsproduktberechnung: Lange Reihen ab 1970. Wiesbaden.